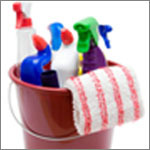 Commercial products for cleaning, polishing, etc. could contain animal substances and more likely have been tested on animals. Some of them could even be harmful for the environment. Forty-five toxic chemicals emitted from household items mix with air and dust that slowly but surely harm us according to a comprehensive review in Environmental Science and Technology by three universities and two environmental groups of USA. Below are some alternatives you could use, so do try making some of these household product recipes. And, if you yourself have any effective recipes or ahinsak tips, please do send them to BWC so they can be added on this page. • Aluminium: To brighten aluminium vessels cook some acidic substance like tomatoes or vinegar (veg) in them. • Brass and Bronze: Soak a cloth in vinegar (veg) and vigorously rub. Alternatively, soak tamarind in water and rub vigorously. Then, shine with soft cloth. • Candle wax: Place metal candle-stands in freezer and peel off frozen wax, wash and dry. Rub wax dripped on tablecloth with an ice cube, when hardened scrape off with a spatula. • Cane furniture: Soak a cloth in a solution of borax (mineral) and water and wipe the furniture with it. • Chocolate stains: Soak clothes in a solution of 30 grams of borax powder (mineral) dissolved in 500 ml water. Wash with a mild detergent (check veg) after 30 minutes. • Chrome: Shine with vinegar (veg). • Coffee/wine stains: Blot the fresh spill with a cloth soaked with club soda (check veg). • Cooking utensils: If very greasy, apply baking soda (mineral) on a damp sponge to remove cooked food and grease. Let pots and pans soak in a baking soda (mineral) and water solution before washing. • Copper: Cut a lime/nimbu in two and rub the pieces on the copper item. Rinse with water. • Floors: For cleaning and polishing floors, first clean floor with detergent powder (check veg) using a rotary brush. Then use oxalic acid powder and tin oxide (minerals) for polishing so that it gives a slight glaze. • Furniture: Mix 1 teaspoon turpentine (resin of tree), 3 tablespoons linseed/flaxseed oil and 1 litre hot water. Stir well and allow it to cool. Use on cloth for cleaning wooden furniture. To clean cane furniture a solution of borax (mineral) and water should be used and then wiped dry. • Furniture polish: Mix 3 parts olive oil with 1 part vinegar (veg), or 1 part lemon juice with 2 parts olive oil. Use a soft cloth. 1. Mix baking soda (mineral) with a small amount of water. 2. Hydrogen Peroxide (chemical element) is a multi-purpose cleaner and excellent disinfectant. It should be diluted in water (about 1 tablespoon in 1 litre) before use. Good for cleansing fruits and vegetables also for which a little salt could be added to the solution. • General stains: Add 1 teaspoon white vinegar (veg) to 3 teaspoons warm water. Leave to dry and apply a little detergent (check veg), dry again and vacuum. 1. Wipe with a damp cloth or sponge sprinkled with baking soda (mineral). Rinse with water and dry with a soft towel. 2. Rub crushed wet newsprint on mirrors and glass tops. Then rub dry newsprint. Cleans well and leaves no foul smell. • Household cleaner: 3 tablespoons baking soda (mineral) mixed into 1 litre warm water makes an effective all-purpose cleaner. • Iron: Clean iron by rubbing paraffin candle wax, switch on and iron out an old rag. For clogged holes in steam iron, fill iron with solution of 1:1 white vinegar (veg) and water. Turn to steam setting, hold horizontal and operate till liquid is over. • Laundry whitener: The use of white vinegar (veg) whitens whites, brightens colours and fades stains. • Linoleum: 1 cup of white vinegar (veg) mixed with 9 litres of water to wash. Then polish with club soda (check veg). • Marble: Marble is very porous and therefore easily stained. Clean with dry borax powder (mineral) and a damp cloth. Rinse with warm water and buff dry. • Mildew remover: Apply lime juice or white vinegar (veg) and salt. • Oil stains: Rub white chalk (mineral) or talcum powder (check veg) into the stain before laundering. • Oven: Clean and deodorise the insides of the oven and around the door seal with a baking soda (mineral) solution. For stubborn odours, leave an open box of baking soda inside, but be sure to remove it before each use. 1. Rub with vinegar (veg) and polish with soft cloth. 2. Rub with extra-fine (000) steel wool dipped in vegetable oil. 1. Spray glass with water and wipe clean with newspaper. 2. Use white vinegar (veg) or rub alcohol and water. • Porcelain: Dip damp cloth in baking soda (mineral) and rub over stains. For especially stained surfaces, make a paste with water and apply it. Allow to set before rubbing clean and rinsing. 1. To remove tarnish, apply a baking soda (mineral) and water paste with a damp sponge or soft cloth. Rub until clean and buff to a shiny gloss. 2. The suds of soap-nut/ritha seeds soaked in water can clean silverware very well. • Stain remover, toilet bowl cleaner: Vinegar (veg) cleans well. • Stainless steel: Clean with hot soap suds and immediately wipe dry to remove finger marks and water spots. Polish with baking soda (mineral) paste. If scratched, rub with steel-wool and buff with soft cloth. • Ant control: Pour a line of cream of tartar (mineral) at the place where ants enter the house — they will not cross it. Wash counter-tops, cabinets, and floors with equal parts of vinegar and water to repel ants. • Anti-termite treatment: Apply suitable anti-termite formulas to wood before monsoon to protect it from being ravaged by white ants/termites. It only works as a preventive. • Beehive removal: Place a rag preferably soaked in kerosene (mineral) or camphor/kapoor (wood origin) tied in muslin cloth as close to the hive as possible. Keep an exit for the bees to fly elsewhere. • Caterpillars: Stripping old fruit from the vines and trees will keep insects from laying eggs. 1. Place whole bay leaves/tej patta and/or peeled cucumber in locations which the cockroaches are frequently found. 2. The entire house can be made cockroach-proof if boric powder (mineral) is sprinkled or mixed into the plaster/paint on all walls and ceilings before painting. • Flea and tick repellent: For companion animals. Feed brewer’s yeast and garlic. Also Vitamin B if you can get non-animal alternative. Place herbs such as fennel/kalonji, rue/brahmi, pennyroyal, and rosemary and/or eucalyptus/nilgiri seeds and leaves, where the animal sleeps or on the animal to repel fleas. Add one to two drops of either lemon-grass or citronella/ganjani oil to the dog’s shampoo or in the last water rinse. 1. Eucalyptus oil or neem oil. 2. Put a couple of camphor/kapoor (wood) pieces in a small bowl of water and stand below the bed. Ensure that no small children, cats or dogs can reach it. 3. Just before sunset, burn incense/loban (mineral) on coal and carry vessel through all the rooms of the house so the smoke circulates. • Moth and Silverfish repellent: Place red cedar, sandalwood chips or tobacco leaves around clothes, books, etc. Camphor/kapoor, cloves/lavang, potpourri sachets, eucalyptus and neem leaves, also help. Mothballs (Naphthalene) are as effective and do not kill if tied in muslin and suspended in the cupboard. • Tree guards: Coconut and fruit trees need to be protected from bats, squirrels, birds, etc. Knowing it is not cent percent effective, the ahinsak way of doing it is to cover the coconuts or fruits with netting. However, tall metal fencing put around individual trees protects them from animals eating the foliage. • Air freshener: Leave an open box of baking soda (mineral) in the room so it absorbs the bad odours. Add cloves/laung and cinnamon/dalchini/tuj to boiling water and simmer so that the aroma fills the air. Scent the house with herbs, and open the windows. • Drain opener: Prevent clogging by using a drain strainer or by flushing drain weekly with boiling water. If clogged, pour ½ cup vinegar down the drain. • Fertiliser: Kitchen garbage converted into compost. 1. Essential oils like lemon grass mixed with water and sprayed removes musty smells from damp, closed rooms. 2. Keep freshly ground coffee inside cupboard. Vinegar and baking powder freshens drains. • Odour remover: On carpet or furniture (from spills or accidents) blot the fresh stain with a cloth soaked with cider vinegar. Vinegar kept in an open bowl also absorbs cooking smells effectively. • Pesticide: Crush garlic and soak in hot water, then cool and spray the water on plants. A dilute solution of one litre of groundnut oil in a hundred litres of water sprayed on the papaya plants is a desi cure for papaya mosaic disease.